The compact, 5.8kW, Level 2, LCS-30P Electric Vehicle Charging Station from ClipperCreek is designed to take the wear-and-tear of everyday use. It's tough NEMA 4 enclosure ensures product durability and reliability, indoors or outdoors. FASTER CHARGING SPEEDS: The LCS-30P Level 2 EV Charging Station EVSE - charges your car up to 4x faster than the cordset that came with your electric vehicle. It is a plug-in (NEMA 14-30) car charger and works with ALL electric cars. 24 Amps of power (5.8kW) is perfect for electric vehicles like the Prius Prime, the Porsche Panamera, and the Mitsubishi i-MiEV. 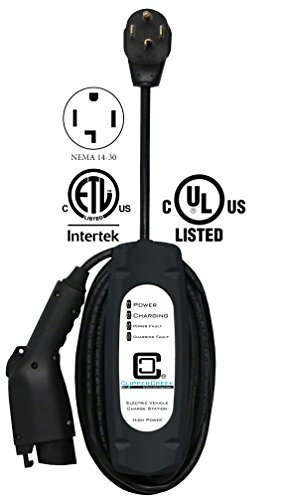 SAFETY CERTIFIED: Unlike some brands sold on Amazon, ClipperCreek's UL and ETL listing demonstrates this product has met the requirements of widely accepted product safety standards for EV charging stations. It has a NEMA 4 enclosure for safe and reliable indoor or outdoor installation and is backed by our 3 year warranty and outstanding customer service. EASIEST INSTALLATION: We've made charging your car as easy as charging your mobile devices. ClipperCreek EV charging stations need no assembly - just plug in to your existing NEMA 14-30 receptacle or install a 14-30R 220V-240V socket, plug in the LCS-30P, and you're done!